Packed with a powerhouse of healthy, antioxidant rich organic vegetables, super rich immunity mushrooms, flax seed, amino acids, fiber, phytonutrients, vitamin C and super fruits from around the world. The Daily Dose may enhance the alkalinity of your body pH. The Daily Dose Super Greens may help make your blood pH become more alkaline. - SATURATES your blood with many powerful sea vegetables that are not present in other vitamins and nutritional products. - High in Vitamin C (215%), a critical antioxidant that protects and defends your body from free radical damage. - BOOSTS the immune system and also boosts immune function. Everyone should try this product! I think so anyway. 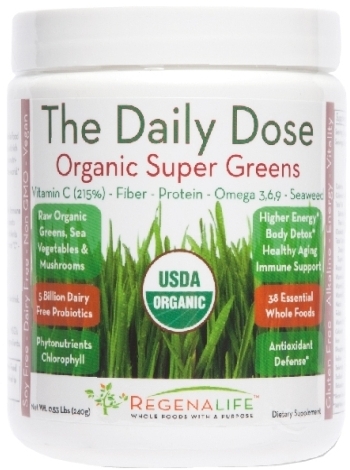 The Daily Dose Super Greens has vitamins, protein and fiber. I've tried similar products that tasted like grass. This product has a great taste with a hint of lime. I mix it up with juice, water or a smoothie. It gives me energy throughout the day. Try it out and see for yourself. I give it 5 of 5 stars. 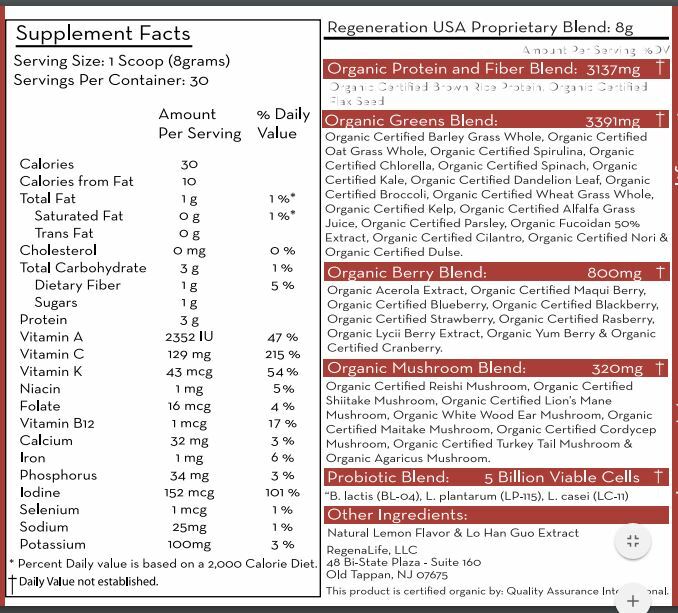 - Chuck H. The Daily Dose Organic Super Greens is a daily drink providing 38 essential ingredients for healthy and total immune support.